Casey Bertke goes up for two points in Cardington’s win over East Knox in Friday night’s girls’ basketball game. Cardington’s Paige Clinger works inside for a lay-up against East Knox Friday. 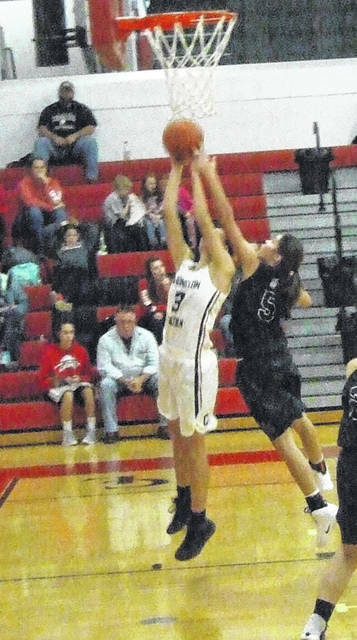 Cardington’s Lady Pirates struggled early on offense, but were able to rely on stifling defense to take the lead on visiting East Knox Friday night. Then, when the shots started dropping, they widened that advantage until the final buzzer sounded with them on top by a 66-27 count. The coach couldn’t claim about his squad’s defensive performance, though. East Knox didn’t score until the 1:14 mark of the first quarter, by which time the Pirates had managed to put 10 points on the board. Edwards noted that his team has a lot of size inside, which can make it hard for other teams to manufacture consistent offense. “We have Casey (Bertke) at 6’3”, Hannah (Wickline) at 6’ and Paige (Clinger) at 5’10” with one of the longest wingspans I’ve every coached,” he said. Bertke carried the team offensively in the early going, scoring their first seven points and eight of the team’s 13 in the first quarter, as they jumped out to a 13-4 lead after eight minutes. Beth Hardwick scored two baskets in the opening minutes of the second quarter, while Bertke added another bucket in boosting that lead to a 19-4 margin. Edwards noted he has a good mix of talent this year, with a handful of very experienced varsity players to go with a quartet of talented freshmen in Hardwick, Dana Bertke, Karsyn Edwards and Kynlee Edwards. The coach noted that one big advantage that freshman class is giving him and his staff is increased depth. Through three games this season, he said that he’s been able to keep everyone’s minutes manageable. Coach Edwards also is pleased with his team’s scoring diversity. Against the Bulldogs, 10 different girls tallied points. Over the final 4:06 of the second period, Kynlee Edwards scored five, while both Wickline and Taylor Reppart picked up three and both Casey Bertke and Clinger added one bucket each, as Cardington took a 34-12 lead into the half. Four points by Casey Bertke and a put-back by Wickline made the score 40-12 two minutes into the third quarter. By the end of the period, the margin was over 30 points at 54-20 and the Pirates never looked back in winning by 39. Casey Bertke, who also celebrated her birthday that day, poured in 18 points to lead Cardington. Kynlee Edwards added 12. After the contest had concluded, coach Edwards was excited about the potential his team has, citing that depth, as well as the versatility that some of his players have.